It is never too early to prepare for Christmas, and the folks with Operation Christmas Child are ready to start preparation for their shoe box gifts. They are having a kick-off at Temple Baptist Church, 1148 Gallia Street, Portsmouth, on July 29, at 10:30 am. Gaylene St. Leger Cox, Southeast Ohio Area Media Relations Coordinator said they will be having a guest speaker, Luis Gonzalez from Panama to tell his story. When Gonzalez was a young boy, he received one of those shoe boxes. He is looking forward to sharing how the simple gift had a life-changing impact. Operation Christmas Child, a project of International Christian relief organization Samaritan’s Purse, delivers gift-filled shoe boxes to millions of children in need each year. For more than 15 years, Scioto County families have packed shoe box gifts for boys and girls around the world. 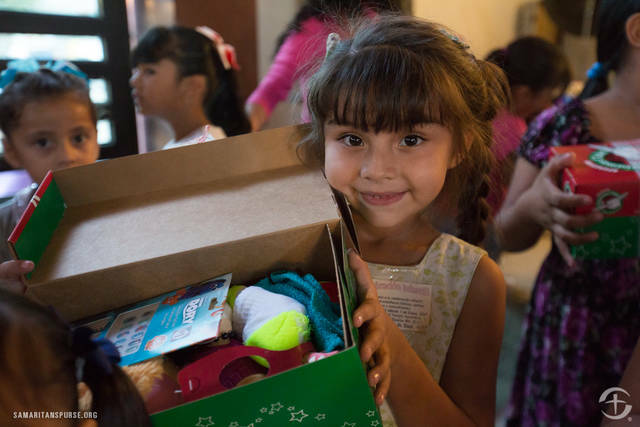 Gonzalez wants to encourage residents, as they kick off the upcoming collection season, to fill thousands of shoe boxes with fun toys, school supplies and hygiene items—contributing to the global goal of reaching 11 million children in Jesus’ Name. Gonzalez grew up in Panama and was raised in a ghetto by a hardworking, single mother in a small house with a dirt floor. All Gonzalez ever wanted to do was to go to school, but could not because they were unable to afford school supplies. His mother told him that if he really wanted to go to school, he needed to pray for school supplies, so that’s exactly what he did. The next day, on a friend’s invitation, Gonzalez attended a nearby church where he received an Operation Christmas Child shoe box gift. It was the first gift he had ever received. When he opened it, amidst the candies and action figures were the school supplies he so desperately needed. That day, Gonzalez and his mother realized that God is real and that He can answer prayers. During Operation Christmas Child’s National Collection Week Nov. 12 – 19, Scioto County residents can drop off gift-filled shoe boxes at multiple locations across Scioto County. This year is special to Operation Christmas Child, as it has been 25 years since Samaritan’s Purse began distributing the shoe box gifts. The goal of this project is to tell children around the world the true meaning of Christmas, when God sent His great Gift to mankind. Franklin Graham, Billy Graham’s son, the President of Samaritan’s Purse quoted, “For the past 25 years, we have been collecting shoe boxes filled with gifts and delivering them to children in need around the world. Each box is an opportunity for a boy or girl to experience the love of God in a tangible way and hear the Gospel.” The mission of Operation Christmas Child is to demonstrate God’s love in a tangible way to children in need around the world, and together with the local church worldwide, to share the Good News of Jesus Christ. 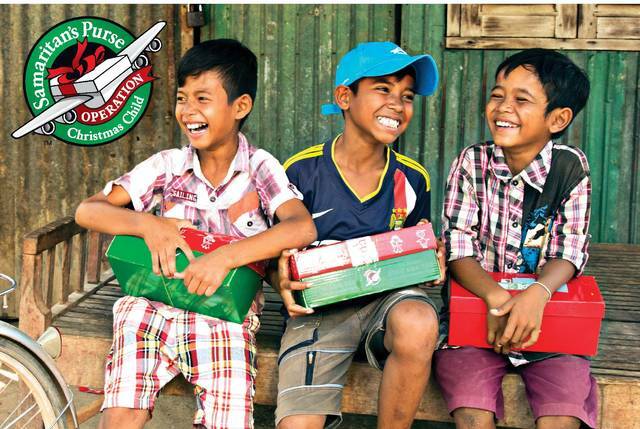 Since 1993, Operation Christmas Child has collected and delivered more than 157 million gift-filled shoe boxes to children in more than 160 countries and territories. The flyer that Samaritan’s Purse passes out tells how to pack a shoebox: Use a standard size shoebox for either a boy or girl, (there are pre-printed shoeboxes on their website: samaritanspurse.org/occ), put in a “wow” item such as a doll, ball with a pump, or stuffed animal, pack full with other fun toys, hygiene items, and school supplies, pray for the child, include a donation of $9.00 to cover the shipping and other project costs, take the shoe box gift to a local drop-off location during the National Collection Week, the third week in November or visit the website to find one near you. This is a great time to start filling up boxes, as school supplies are on sale at many local retailers. You could have your boxes packed and ready to go before you even think of starting your own Christmas shopping. What a great way to share something small, but yet so big for children across the world, that may never get anything.